ARC’s Digital Document Archiving & Management System captures, organizes, and centralizes all of your documents, giving you instant access to any document from your desktop or mobile device. 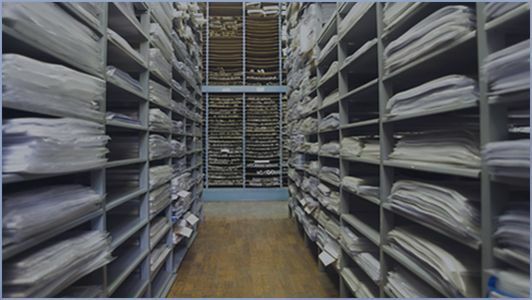 Physical document archives are inefficient, costly, and frustrating. The time your employees spend rifling through drawers and rummaging through papers adds up fast; and while you’re searching through boxes, your business is taking a back seat. ARC’s cloud-based Archives services put you back in the driver’s seat. With our mobile document archives solution, your mountains of paper are transformed into an intelligently indexed digital archive, so you can store, search, and retrieve your documents with lightning fast speed. Your business relies on its detailed documentation, but that doesn’t mean you have to be held captive by it. What good are your documents doing you if you can’t access them when and where you need them? Both on and off-site storage systems limit your ability to retrieve the information you need. Instead of focusing on the tasks that matter and investing in your company’s growth, productivity and cash flow are drained by the ever-increasing costs of a physical document archive. As physical archives grow; they become less searchable; yet, the costs of maintaining them grow greater even as their value and functionality dwindles. 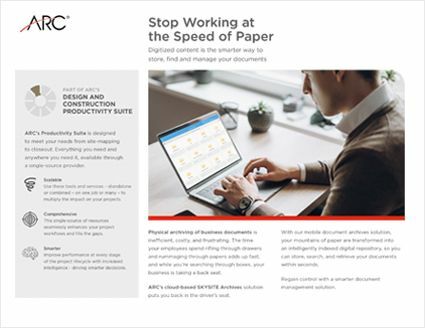 ARC’s cloud-based document archiving and storage management system achieves drastic reductions in the costs and time that businesses lose to paper archives. Gone are the days of paying to store and retrieve your documents and digging through drawers to find the information you need. With our cloud-based archives, you gain instant access to all of your documents on all of your devices. How much did document storage cost you last year? A capable cloud-based archive solution has been shown to reduce costs and increase productivity up to 33%. Your physical archive costs, on the other hand, will increase year over year. Digitally archiving 1,000 boxes saves businesses 130 hours per employee, $180,000 in print charges, and $75,000 in storage fees—annually. Would a flood or fire at your storage facility destroy years of diligence and knowledge? Keep your legal files, critical records, institutional knowledge safe and eliminate the risk of lost or damaged documents with our cloud-based archiving solution with advanced encryption technology. Does your current system of records management meet legal requirements for document retention? ARC Archives allows you to tailor retention and purging policies to your company’s needs. Set retention timelines and automatic notifications, and assign retention timelines and managers to reduce legal risk and comply with retention regulations. Lose the filing cabinets and storage limits with a digital document archive that doesn’t penalize you for growing your business. ARC Archives gives you a powerful search and storage solution that you can access anywhere from your mobile or desktop device without file limits. Quickly find what you need when you need it with lightning fast search capabilities that can read text, drawings, and even scans. Our advanced information capture (OCR) storage system allows you to upload, store, and quickly retrieve files in practically any format, including 3d files, and lets you view them without specialty software installation. Our leading edge search algorithm searches your documents inside and out, and our custom index tagging and smart filtering ensure that when you search for a file, you find it—fast. Learn more about ARC’s digital document archiving and storage management system and see how a cloud-based mobile platform can help mitigate risk while saving your budget and your time. Our mobile platform allows your team to access information anytime, from any device. No internet? No problem. Changes will sync as soon as you are connected. Manage and access your documents from anywhere on your pc, laptop, iOS or Android device. With email management, all of your project messages can be automatically synced and archived with the rest of your documents, so even searching through emails becomes a thing of the past. Need to retrieve a document or an email? No problem. Our solution is so simple and intuitive, even the most non-technical team members will ramp up quickly–resulting in increased productivity. 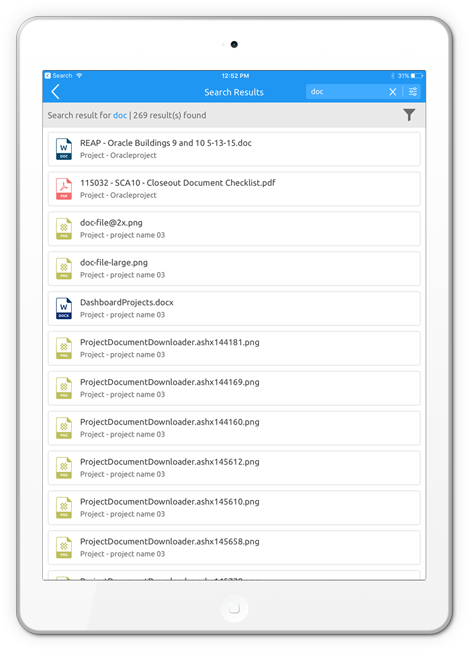 Easy to learn, easy to use: Even large 3D files are easy and fast to upload and share, so your legacy documents and new documents are all stored in the same place without the usual lag time that comes with moving large files. You control who has access to your documents and set the access levels that work for your business, giving your employees an intuitive system to access the documents they need that is backed by enhanced security protocols that protect you from phishing attacks, data breaches, and password leaks. Keep your team on the same page with file sync to all of your devices. Offline, online, on your desktop or on your phone, you have access to the files you need and can rest assured that the information in front of your team is always up to date. Are your documents protected from loss, damage, and theft? Can you access the critical information you need to respond to an emergency in seconds instead of hours? Are the compliance documents you need to respond to an audit available at a moment’s notice? ARC’s Archiving services give you more than just an information management solution; we give you back your time, your budget, and your peace of mind. Ready to turn your mountains of paper archives into mobile molehills? Call us today at 855 500 0660 to get started.